Taking a closer look at the Knickernappies Stay-dry Hemp Doublers! They come pre-washed. 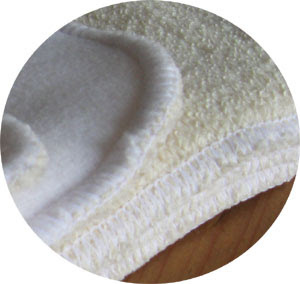 Our hemp is pre-washed so the doublers won't shrink and you can wash and use them right away with your diapers. No need to have to wash them separately before use, we've taken care of the pre-washing for you! Topped with Knickernappies custom milled 100% polyester microfleece. 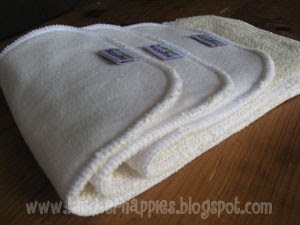 Our super soft microfleece makes these doublers a pleasure for baby to wear and keep baby feeling dry while helping wick the moisture through to the hemp side. Our Hemp is a 45% Hemp, 55% Cotton blend and makes these doublers super absorbent and trim! To read more about Hemp's amazing properties you can read a previous blog post here The 411 on Hemp! Our doublers can be used as a doubler inside of your favorite fitted, on top or inside of a prefold or even as an insert inside of a pocket diaper! You can use them any way you'd like! Available in 3 convenient sizes; Small: 5"x12"-Medium: 5"x14"-Large: 5"x16"
Ready to shop? Visit our Retailer Locator and get your Stay-dry Hemp Doublers today! I use these every day! Our favorite diapers are the Knickernappies, but we use fitteds when those aren't handy and I always put a hemp doubler in. We don't need the absorbency; I just like to put that soft microfleece against my daughter's skin instead of just the hemp fitted. These are my favourite inserts as they are very absorbent and leave baby feeling dry. I use them with my prefolds and as the top layer in a pocket diaper. They are my essential accessory for night time diapering. How nice to not have to prep them! Baby isnt here yet, but I have already started prepping all my natural inserts!